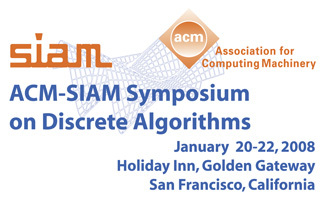 Jointly sponsored by the ACM Special Interest Group on Algorithms and Computation Theory and the SIAM Activity Group on Discrete Mathematics. A list of papers accepted for presentation at SODA08 is available here [47 KB, PDF]. Three student travel grants are available. For more information, please see Students section. A concert will be presented by the California-based band "Lady X and the Positive Eigenvalues" on Sunday, January 20, from 9:00 PM - 10:30 PM in the Emerald Ballroom. A cash bar will be available. Shang-Hua Teng (Chair), Boston University and Akamai Technologies, Inc.